University of Washington Press, 9780295990040, 152pp. 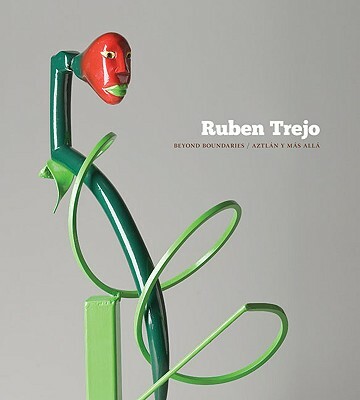 Ruben Trejo Beyond Boundaries / Aztl n y m's all is the first comprehensive survey of Trejo's art and career. It focuses on more than fifty works from 1964 through the present, including pieces from his delightful life-size, puppet-like Clothes for Day of the Dead series; works from the Calzones series -- cast bronze underwear and jalapenos -- that challenge the Spanish machismo culture; seminal examples of his lifelong exploration of the cruciform image; and much more. The volume includes biographical and interpretive essays, as well as a chronology, list of exhibitions, and bibliography. Ruben Trejo (1937-2009) was born in a Chicago, Burlington & Quincy railroad yard in St. Paul, Minnesota, where his father, a mixed Tarascan Indian and Hispanic from Michoac n, Mexico, and his mother, from Ixtlan in the same Mexican province, had found a home for the family in a boxcar while his father worked for the railroad. Trejo became the first in his family to graduate from college, and in 1973 he moved to the Pacific Northwest, where he began a thirty-year association with Eastern Washington University as teacher and artist. His isolation from major centers of Chicano culture led him to search for self-identity through his art. Influenced and inspired by such writers and artists as Octavio Paz and Guillermo G mez-Pena, he explored a dynamic, multidimensional worldview through his sculpture and mixed-media pieces and created a body of work that deftly limns his identity as an artist and a Chicano. Throughout his long teaching career, he worked tirelessly to create opportunities for young Chicanos through tutoring and mentoring.